The Library has launched its next temporary exhibition: ‘All the World’s a Stage’. The exhibition aims to show that the eighteenth century was a great age for the theatre. During that time, many theatres were built to accommodate the large crowds keen to see plays, musical performances, variety acts, acrobats and other entertainment. Although the growth in the number of theatres meant that people from all walks of life could attend events, it was not unanimously considered to be a positive addition to life. Some even accused the theatre of immorality! English theatre critic, Jeremy Collier, believed that the theatre should encourage high moral standards and discourage immoral behaviour. William Law, a Church of England priest, considered the theatre to be of a sinful nature, while John Dennis, playwright, poet and critic defended it strongly. The Library holds copies of their works, which show these differing opinions. It also has on display the autobiography of Colley Gibber, who was a playwright, actor-manager and Poet Laureate and whose work is considered an important historical source for the theatre. 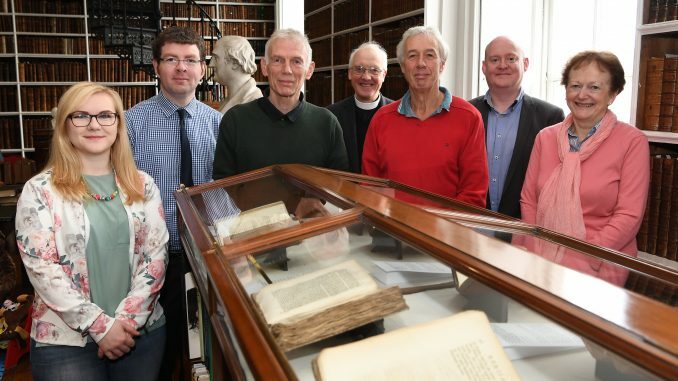 The exhibition will remain on display in the Library’s Long Room until the end of December 2018. Book Launch of The Cambridge Edition of the Works of Jonathan Swift: Irish Political Writings after 1725: A Modest Proposal and Other Works.